You are here: American University studentjobs Want a Part-time Student Job this Year? Want a Part-time Student Job this Year? AU's new online employment application allows students to complete one application which can be used to apply to several positions. Are you an AU Student looking for part-time work? Did you receive a Federal Work Study (FWS) award and want to know how to accept your award? We talked to Ganiat Harris from Human Resources to find out more. If you received a FWS award as part of your financial aid package you are able to work part-time and earn money that will not affect your financial aid eligibility in the future (a good thing!). FWS also qualifies you to work in one of many convenient and rewarding student jobs. If you have not yet accepted your FWS award, log into my.american.edu and navigate to the "Finances" page. Please direct questions about your FWS award to AU Central at 202-885-8000 or AUCentral@american.edu. If you did not receive a FWS award, you may apply for any of the positions that are open to all students (check the job opening for details). 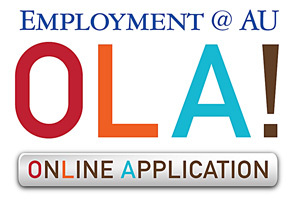 To begin looking for a job, view student job openings and create an account in our new online application system (OLA!). Through this new system, you can complete one application, apply to multiple positions that match your interests and qualifications, and check the status of positions for which you have applied. For help finding or applying for a job, please review our application instructions or contact Human Resources at 202-885-2591. To learn more about student jobs, visit www.american.edu/studentjobs. Once you have found your job, visit steps to getting hired to find out about how to complete required employment paperwork. Each year, the university and its community partners employ hundreds of student employees who help to advance the work of AU faculty and staff, D.C. public schools and after-school programs, and local nonprofit organizations and government agencies. Your talents are needed in a big way, so find the job that's right for you today.